Why not market your communities to them first!! PeopleWithPets.com offers affordable advertising opportunities to increase traffic and branding for your pet friendly apartments and homes. Why List Your “Pet Friendly” Apartment Community or Rental Home? Celebrating 75 years online (in dog years). Newly redesigned “Responsive” website (accessible by all mobile devices). PeopleWithPets.com’s redesigned website is optimized across different media channels so that we have you covered to assure that you don’t miss any mobile traffic. 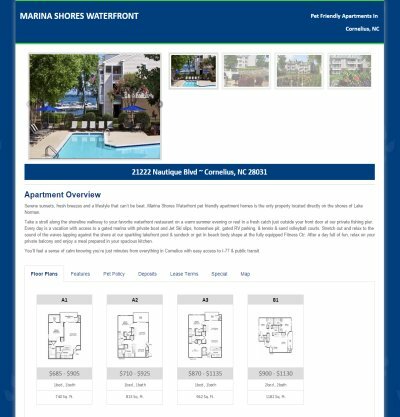 You will have 24/7 access to our Listing Management Console and the ability to add/edit your own listing where you can make updates as rents or specials change or if you want to change out photos or add amenities. Only $299 per year (ask us about the “Multiple Community” and “No Breed Restriction’ discounts. No where else can you get this amount of exposure and traffic for less than $1.00 per day! We can be found on Page 1 for “Pet Friendly Apartments” on all major search engines. Reach millions of unique visitors annually! We provide an ongoing Linking Strategy (with all appropriate apartment and pet industry websites) to increase back links, build Page Rank and thus increase ranking. We target a specific renter profile…their pets. According to one survey 72% of renters own pets. Direct communication with your property via email, phone or fax. User friendly-Easy to use directory; prospects find your property with a few clicks. We feature a property weekly on our Social Media sites (Facebook & Twitter) and ‘Pin’ your community on our Pinterest page to encourage more traffic & leads for you. We provide ongoing search engine optimization and fresh content to assure that we continue to enjoy page one listings on major Search Engines. We work to continue to build quality authoritative back links to our website which is one of the most important aspects of high search engine ranking. ‘No Breed Restriction’ discounts, please email us . What’s Included with Your PeopleWithPets.com Premium Listing? Responsive Website (accessible by all Mobile Devices). Access to our Listing Management Console and the ability to add/edit your own listing.